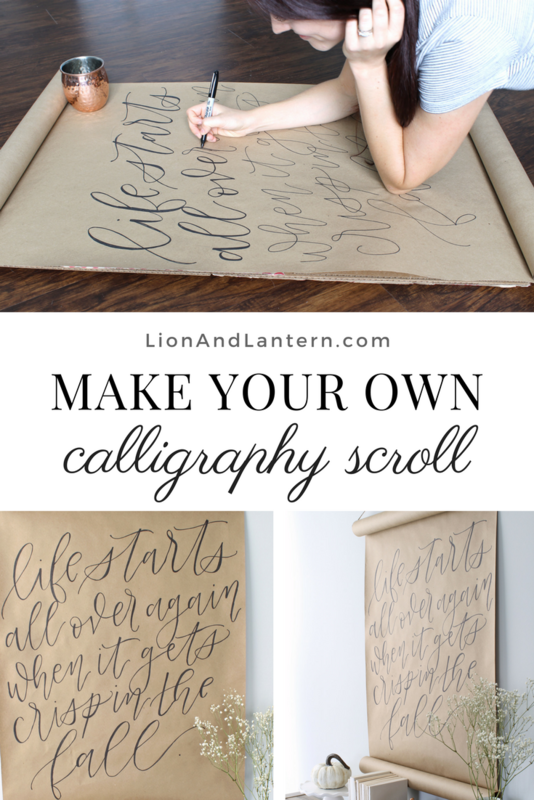 Create your own calligraphy scroll with this simple tutorial! 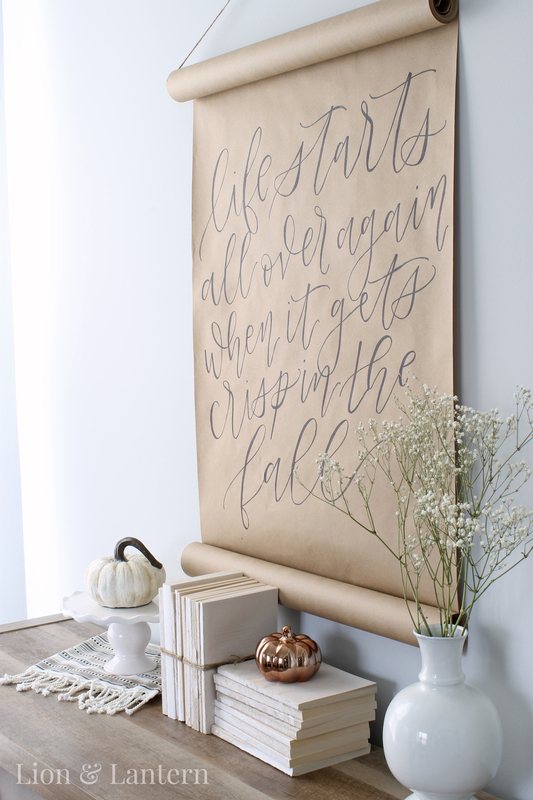 Scrolls are a lovely way to warm up a wall and add a seasonal touch on a budget. Hello friends! I hope that you all had a restful Labor Day weekend. Although we technically have a few weeks of summer left, Labor Day weekend often feels like a gateway to autumn. Personally I’ve been daydreaming about cozy fall decor for weeks, and I have many ideas to share, so let’s just get started today! 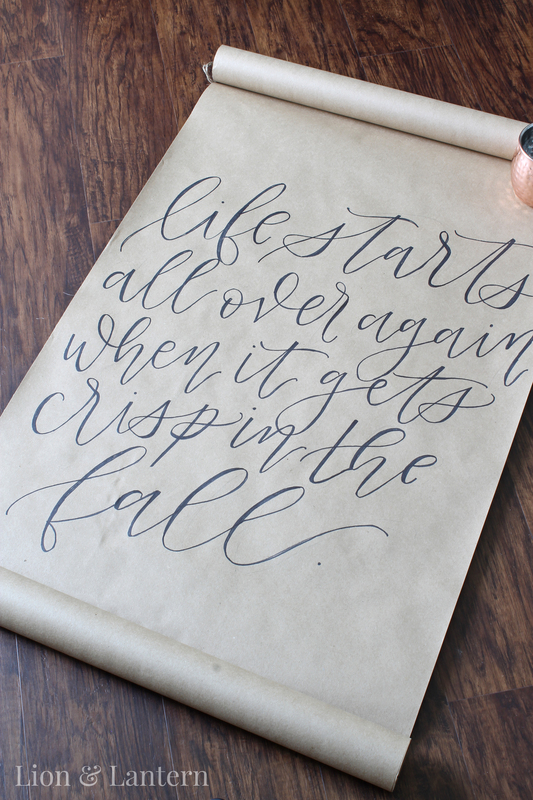 Grab a mug of your favorite fall drink and keep reading for some autumn inspiration. Kraft paper roll. I used a Plain Kraft Jumbo Roll from Current Catalog, but there are many options on Amazon such as this and this. Twine or string. Anything sturdy will do! A flattened cardboard box, newspapers, or poster board to write on. This is a precaution so you don’t stain your floor/table with marker! Begin by rolling out your Kraft paper to the size you desire; you may need to use a few heavy objects to hold it open. Be sure to leave some excess to create the bottom roll. Using paperclips or bobby pins, secure the bottom roll in place. (You can see my bobby pin in the bottom right corner of the photo above.) You can always adjust the bottom roll after hanging. 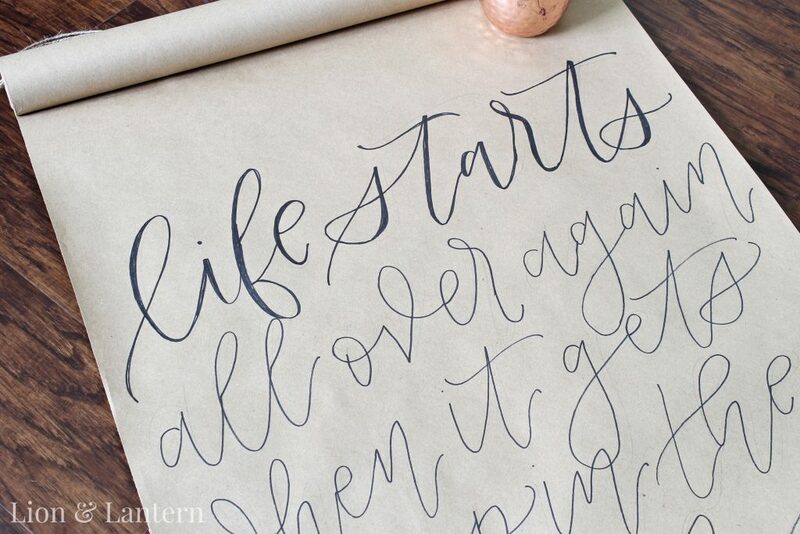 Next comes the magical step, where we turn regular handwriting into “calligraphy”! The basic idea is to thicken any line that is a downstroke. Go back through your quote, letter by letter, and thicken any line where your pen moves downward. Suddenly your writing looks a lot more fancy! 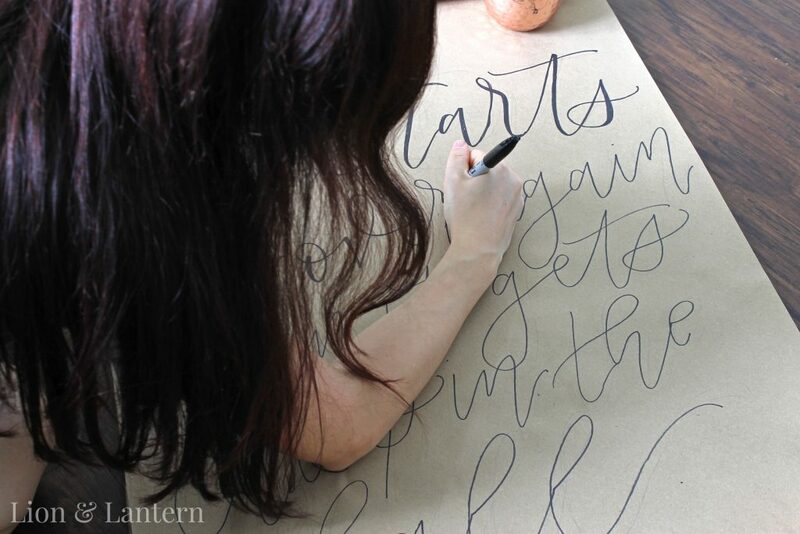 This step requires some patience, but try to move slowly and be consistent with the thickness of your downstrokes. Tada! Erase the pencil and you are just about finished. The final step is to thread your twine through the top roll so that you can hang your scroll. You may need to tape the end of the twine to a pencil and shimmy it through the top roll, if the hole is a bit small. I doubled my twine up to make it stronger (so I threaded it through the top roll twice). Then I trimmed and tied the twine, and slid the big “loop” of twine so that the knot was hidden inside the top roll. Hang your scroll with a picture hook or nail appropriate for your wall. Then step back and enjoy! 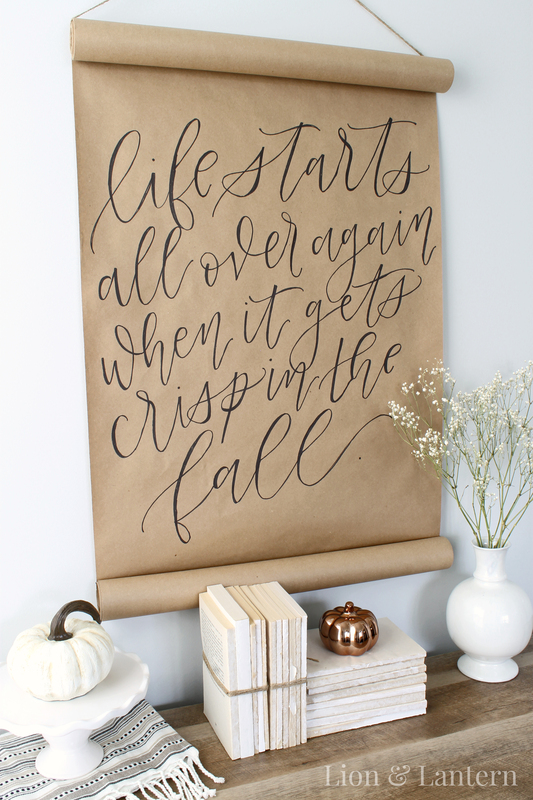 One of my favorite things about this calligraphy scroll is that you can easily change the quote for a new season or occasion. Just roll up the bottom part of the scroll so that it hides your first quote, clip/pin the bottom roll in place, and start again. 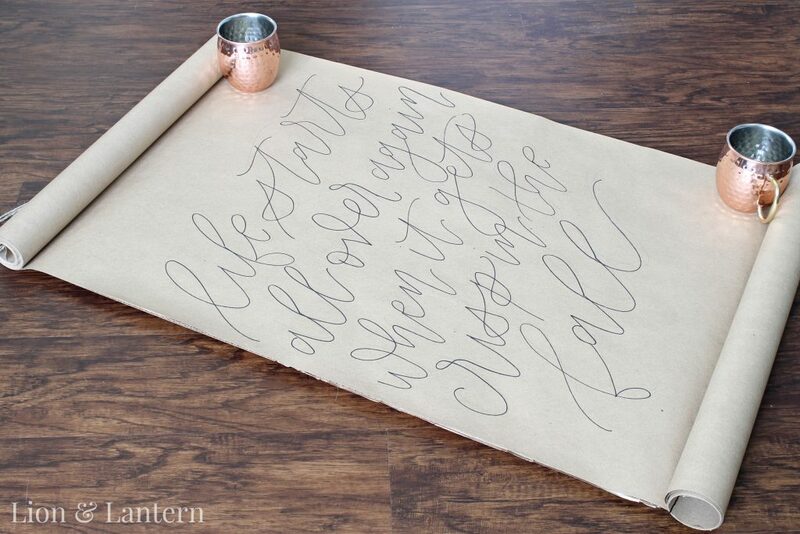 I already have two quotes on my scroll; you can see my Ralph Waldo Emerson quote here! Thank you so much for stopping by today, friends! 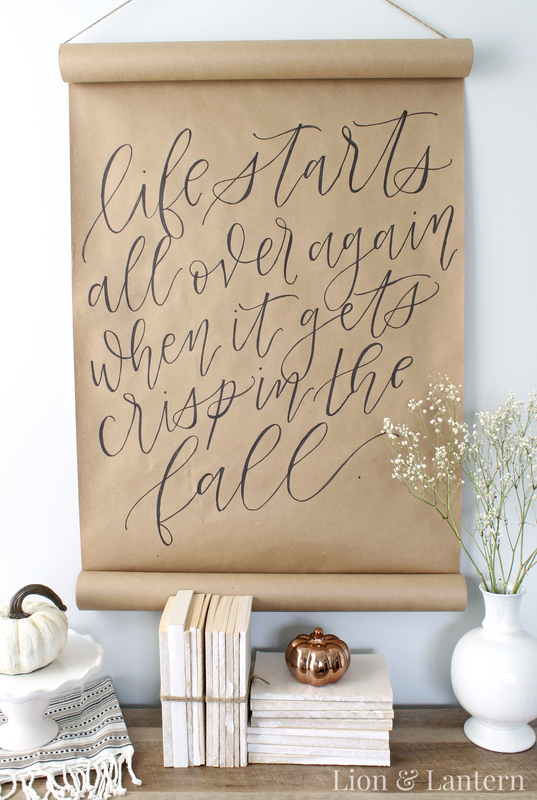 I’m looking forward to sharing more autumn-inspired decor, so check back soon! Great job! It looks lovely! Ellen, thank you so much! Yay, yes please try it. Tag me on IG if you do because I would love to see! These are great! Thanks for the tutorial. I was fortunate enough to find a roll of paper at Dollar Tree! What a bargain considering we already had the twine and markers! 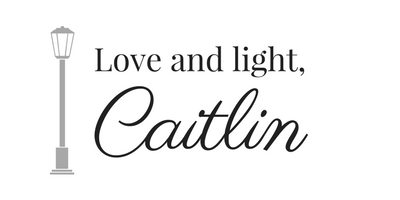 This will be fun way to practice cute lettering styles without spending a lot! Our church group wants to make a birthday scroll banner for a very special person to have it unrolled by 2 people to announce her surprise party. Any ideas? Hi Adrienne! You could write the words sideways (so the rolls are on the sides instead of the top and bottom) so that they are oriented properly when two people unroll the scroll! That would be so cute! I would just leave extra blank paper on either side of your message so you have lots of roll to work with! Hi! I love this!!!!! On the bottom roll. Do I need to secure it with something else other than pin/clip, so the bottom won’t roll back? Or the clip will keep it from rolling back? Hi Olga!! 🙂 I’m so glad you like the tutorial! The roll probably won’t stay down on its own. I slid a pencil inside the bottom roll to weigh it down!